Looking to add more protein in your diet? Tuna is a great way to get extra protein. I don’t have to cook it, and I can just pop a can open and it’s ready! I like adding tuna to other easy dishes to up the flavor factor. By including it in my favorite pasta salad, I can have a tasty side dish ready to go along with my BBQ in no time. See how to make this Easy Pasta Tuna Salad below, and then continue to the end for a $15 PayPal cash giveaway! THIS GIVEAWAY IS CLOSED. Make the Suddenly Pasta Salad Classic according to the directions on the box (there are lots of other Suddenly Salad varieties, as well!). Once the Suddenly Pasta Salad is finished cooking and draining, place the pasta in a large bowl. This can be a serving bowl or a storage bowl. Add the tuna and the raisins. Stir the pasta salad completely. 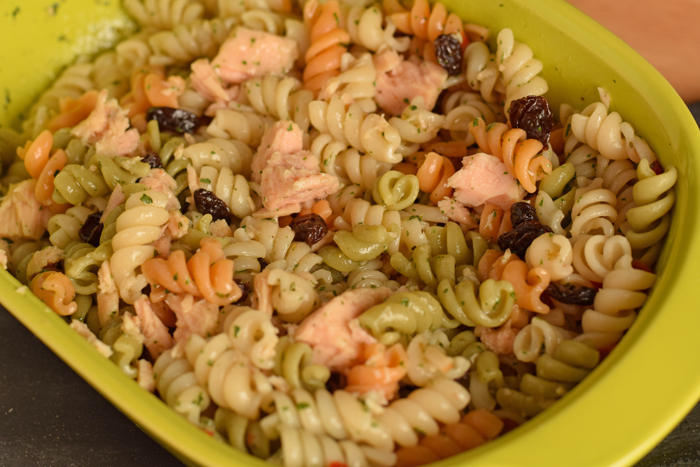 Drizzle your favorite dressing on the pasta salad to taste. Start out light, then stir the pasta salad. Continue adding dressing until you’ve reached your level of flavor. 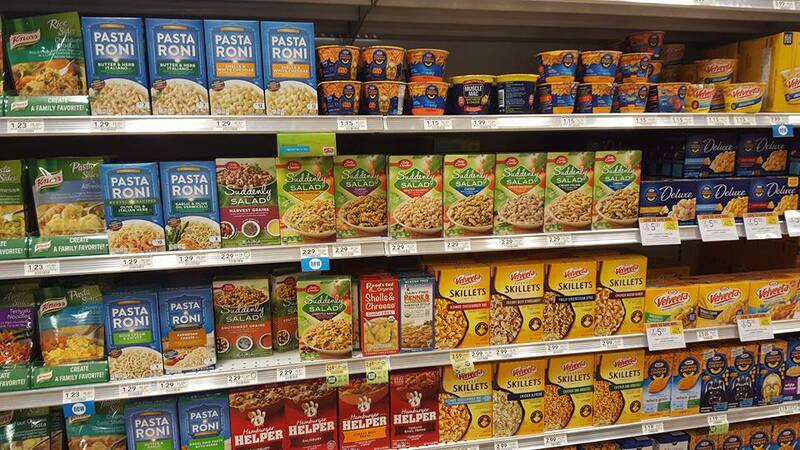 Get your Suddenly Pasta Salad at your local Publix. Click HERE and grab a $.75 off of three coupon! 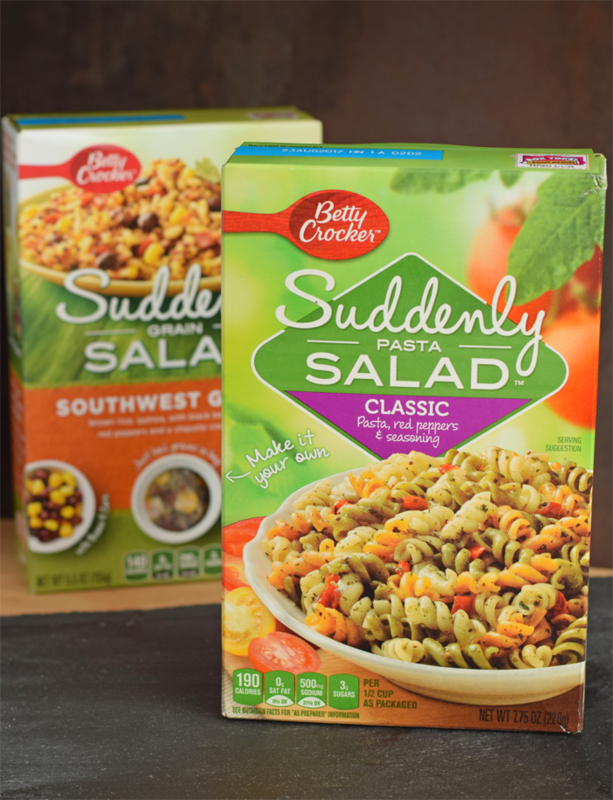 Want to pick up a few boxes of Suddenly Pasta Salad to keep on hand for your next cookout? Suddenly Salad is giving away $15 in PayPal cash in order for one lucky winner to grab Suddenly Salad for themselves! Fine print: Void where prohibited. Only open to those in US and Canada with a valid PayPal address. Open to those 18 and older. Winner will be chosen randomly. Winner will be contacted by email and will have 48 hours to respond before their prize is forfeited to another winner. Only valid entries accepted. Giveaway ends on July 8, 2016, at midnight. Congrats to Tanisha, the winner of the giveaway! I use Suddenly Salad and add shrimp to it. The family just loves it. My favorite side dish is pasta salad and I almost always use Suddenly Salad and add to it! I love throwing my favorite Italian goodies like artichoke hearts, roasted peppers and olives into suddenly salad! Its SO good! I’ve always loved the suddenly salads- they make a delicious pasta salad so easy! I love the idea of adding tuna! I like potato salad or macaroni salad, especially when we use ranch in place of mayo. I like the Southwest style ranch variety of Suddenly Salad. It comes with crunched up tortilla chips, so it would be a great side with any Mexican dish. I like Roasted Garlic, Dill & Lemon Potatoes. I love pasta salad with tons of veggies! A psta asalad or cole slaw! I would have to go with guacamole, but Suddenly Salad looks really good too! Greek Toss Pasta Salad! Thanks for the giveaway! I love grilled veggies, but Suddenly Salad is fabulous, too!! My roommate and I ate this for lunch in our college apartment all the time! That was 20 years ago and I still love it. Potato Salad is my favorite cookout side dish. grilled corn on the cob is a great delicious side and super cheap too. My favorite side dish is cowboy caviar! My favorite side dish is pasta salad. I love potato salad, but I’ll have to try that recipe for Black and Blue Pasta salad on the Suddenly Salad website! My favorite cookout side is mashed potatoes. Love having pasta salad and chips and dips. They are both must haves! My fav cookout side is corn on the cob! I think my fave side dish at a cookout would be fruit salad! 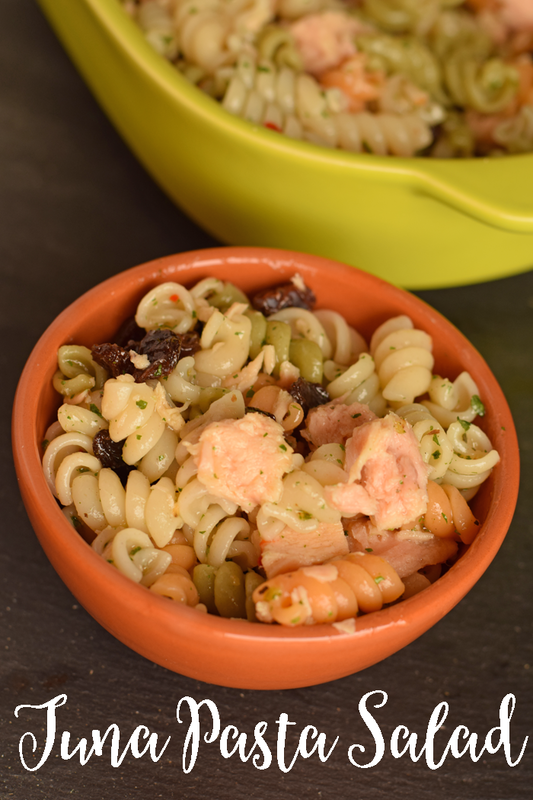 We love the Suddenly Salad Ranch Bacon Pasta Salad. Sooo good! My favorite side dish is Chicken Cucumber Pasta Salad! So good! I always love pasta salad a for a cookout & now that I’ve heard of Suddenly Salad, I think I will be making a lot more pasta salads! My favorite cookout side dish is Italian Pasta Salad. My favorite cookout side dish is potato salad! My favorite side dishes are bbq baked beans and potato salad. I love macaroni salad and coleslaw! My favorite cookout side dish is corn on the cob! I love a homemade pasta salad and twice baked potatoes. My favorite cook-out side dish is grilled corn on the cob! My favorite is my Aunt Carols macaroni and cheese! Hers is the best! My favorite cookout side dish is usually potato salad, but lately I’ve been branching out. On the the 4th we had flavored rice which was very good. This tuna pasta salad looks delicious! I already love tuna, but I notice I eat a lot more of it in the summer. Maybe it’s so light and versatile. Thank you for the coupon. My favorite side dish is baked beans. My favorite summer side dish is homemade potato salad. Thank you for the coupon. I like potatoes salad and pasta salad as sides. My favorite cook out side dish is a cold pasta salad. My favorite cookout side dish is potato salad. I like Suddenly Salad Bacon Ranch Pasta Salad with grape tomatoes added! I like traditional pasta salad with mayo and carrots. My favorite cookout side dish is Suddenly Salad with spicy beef! Summer is so busy, so I’m usually trying to find something quick and easy to bring. I usually make up a suddenly salad and then I may add some extra veggies to it to bulk it up! I love pasta salad! I’ve never used Suddenly Salad, but I think I will try it next week for my son’s birthday party. Thanks for the coupon! And as much as I love pasta salad as a summer side dish, my very best favorite is ramen noodle salad! And homemade guacamole & chips! ***Note: I am having some trouble printing the coupon even though I clipped it and downloaded their printer. I use Linux, which does not always play well with coupon sites that like Windows or Mac. Sometimes Hubz can find a compatible version…sometimes not. It is really a hassle for easy coupons. I love pasta salad or a fruit tray! My favorite side dish is homemade Potato Salad. Mmmm Made with brown mustard,mayonaise, pickles, onions. I should go make some! I also like pasta salad with shrimp or diced chicken! I like pasta salad and potato salad. Now that it summer my favorite side dish is salad, really any kind. Lately I have been mixing fruit with pasta like cut up apples, bacon, feta and Italian dressing or apples, nectarine, diced ham, blue cheese dressing. It all depends what I have on in the refrigerator and what the family likes, use you imagination. I think Suddenly Salad can help in this area, thanks for the coupon. My favorite cookout side dish is baked beans. Love a good pasta salad, yes!! Delish! My favorite cookout side dish is Potato Salad! I love Suddenly Salad! I love Suddenly Salad as a side dish for a BBQ, I remember when they first came out on the market and I thought it was such a good idea. The Suddenly Salad Macaroni Salad is very good! I love serving any variety of Suddenly Salad or deviled eggs for cookouts. I love veggie pizza : ) Thanks for the opportunity! My favorite cookout dish is my homemade potato salad. Potato salad is my favorite side dish! Also, thanks so much for the coupon! I also found a bunch of others we will use! My favorite cookout dish is my homemade potato salad. I love Suddenly Salad. My daughters have eaten it at a young age. My favorite cook out side dish is parmesean pasta. Fruit salad is my favorite side dish in the summer…!! Thanks for the coupon. My fave side dish is potato salad. Our favorite side dish at our BBQ’s is coleslaw. My favorite sides are baked beans and macaroni salad. I love Greek pasta salad as a side dish. My favorite cookout side dish is corn on the cob. My favorite side is potato salad. Bacon and Ranch Pasta Salad! My favorite side dish is potato salad. I like a good veggie like corn on the cob or asparagus. i love steak so i’m going to have to go with the black and blue! Favorite cookout side dish is potato salad. My favorite cookout side dish is BBQ Baked Beans!